Just gotta break off these icicles. A blurry figure seems to emerge from Boston's ever-present snow flurries. It looks haggard, as though the bitter cold has breached the confines of its very soul. It stumbles toward you, and its outline begins to give way to detail. It raises its head, and in its face, you slowly recognize the features of your OWN FATH- wait. Never mind, it's just a new trailer for Dauntless. This four player online co-op RPG is the result of ex-Bioware, Riot, Capcom, and Blizzard developers coming together and saying, "You know what? There just aren't enough games out there for people who want nothing more than to stick it to exorbitantly large monsters." It was first revealed in December of last year, and naturally, the crew at Phoenix Labs decided to show off a little more of their game at PAX East. 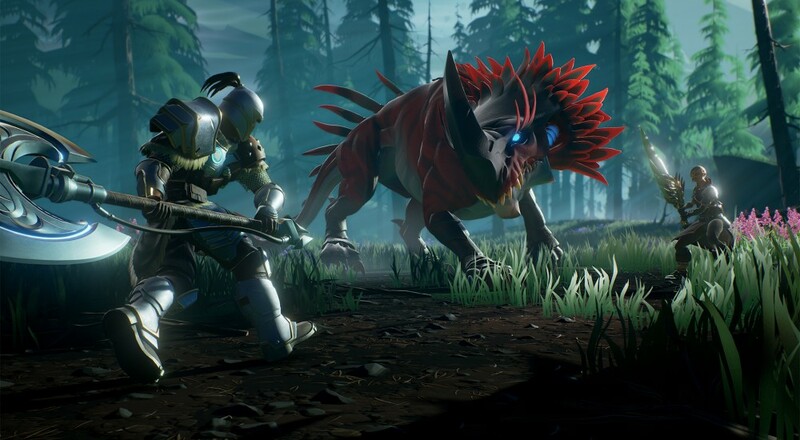 It's got plenty of Monster Hunter vibes, naturally, but it looks like the focus will be less on preparation and more on the act of hunting (and subsequently killing) the Behemoths. There's nothing specific yet, but Dauntless is supposed to be released sometime in 2017. If you're just dying to give it a test run, you can sign up for the forthcoming beta here. Page created in 0.3159 seconds.